Ten years ago Mt Pleasant had fewer restos, pubs and hot spots but was always a spectacular night out. We would invite all our circle of friends out for a night visiting all our favorite haunts: The Reef, Locus, Purple Crab (RIP), Army Navy (aka Legion), Public (RIP), Zigz (RIP, now Hyde), The Whip and sometimes the ANZA (technically off Main but legendary Mt Pleasant). With Rememberance Day Nov 11th the last stop is always the Cenotaph for Memorial Services and the rest of the day to recover from the envitable hangover. Join us EVERY NOVEMBER 10th as we’ll be on Main Street visiting all our favorite haunts! 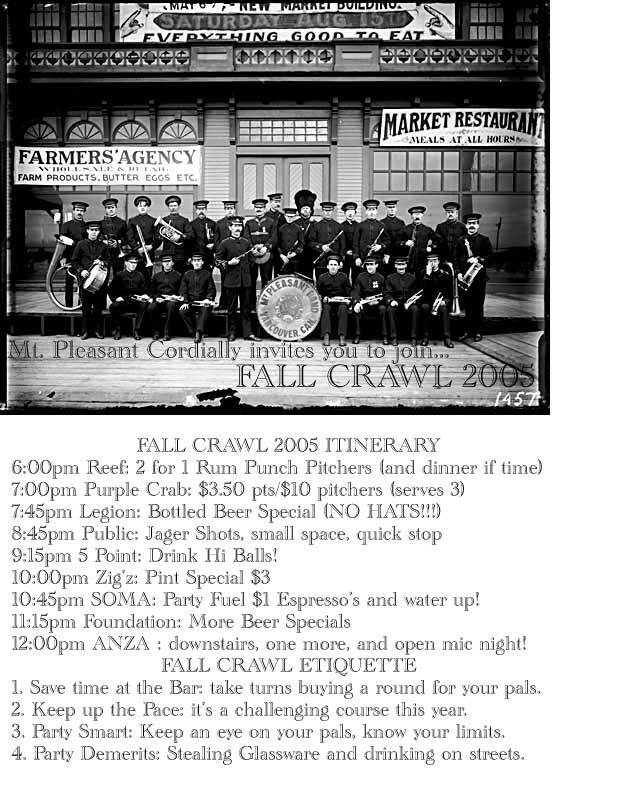 Here’s a itinerary we found from 2005’s Fall Crawl!! !